By the end of 2025, the tally of tax cuts will grow to $10.6 trillion. Nearly $2 trillion of this amount will have gone to the richest 1 percent. By then, the total impact on the deficit will be $13.6 trillion, including interest payments. This analysis does not include hundreds of billions of dollars in so-called tax cut “extenders” for corporations and other businesses that Congress has periodically enacted under each administration. More detailed figures are provided in the tables in Appendix I. These estimates compare the federal tax law in place each year to the tax law in effect in 2000 (assuming normal annual inflation adjustments as required by law). The term “tax cut” is used in this report to describe the difference between what households pay (including what they pay indirectly through the federal corporate tax) in a given year and what they would pay if Congress had made no changes to tax law after 2000. The national debt today stands at $15.7 trillion. Two decisions made since 2000 — tax cuts and America’s wars since September 11, 2001 — together account for roughly two-thirds of that amount. The impact of tax cuts on different income groups has changed over time. 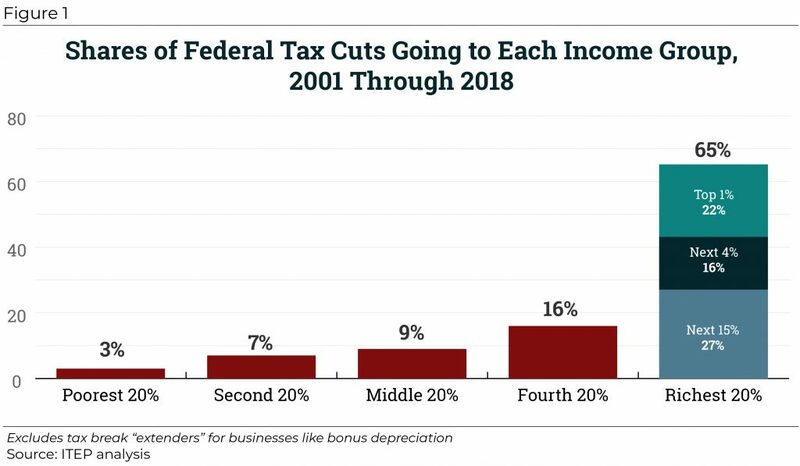 The graph below illustrates the distribution of tax cuts in effect in 2012, 2015 and 2018. 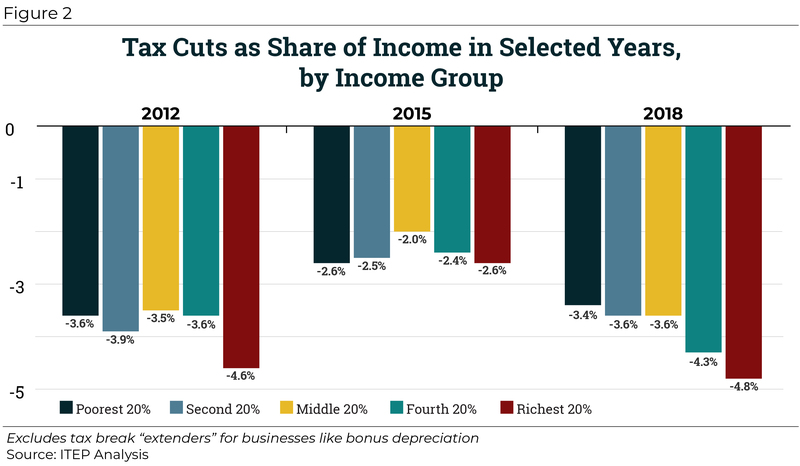 In 2012, nearly all the Bush tax cuts, which provided benefits to all income groups but were very tilted toward high-income households, were in effect. But in the same year, several provisions enacted by President Obama were also in effect (expansions of the Earned Income Tax Credit and Child Tax Credit and a payroll tax holiday), which helped low- and middle-income working people. All income groups received tax cuts, but the Bush-era provisions ensured that the well-off gained more than anyone else. As illustrated by the graph, the richest fifth of households received tax cuts equal to 4.6 percent of their income, a larger percentage boost in after-tax income than any other group received. Figure 2 shows that by 2015 this had changed. Smaller tax breaks were in effect for all income groups. The payroll tax holiday, which helped low- and middle-income working people, had expired. President Obama and Congress had allowed some of the Bush tax cuts for the rich to expire. Many Bush-era provisions still in effect benefited the rich, but this was partly offset by tax increases on high-income individuals that are part of the Affordable Care Act. The result was that the tax breaks in effect in 2015 were smaller for all income groups and more similar when measured as a share of income. But, as Figure 2 illustrates, this again changed in 2018, after President Trump and Congress enacted the Tax Cuts and Jobs Act (TCJA). The TCJA added cuts in the personal income tax and estate tax on top of the Bush-era provisions still in effect, as well as corporate income tax cuts. In 2018, the richest fifth of households will receive tax cuts equal to 4.8 percent of their income, once again larger than those received by any other group. Congress began cutting taxes during this period with legislation in 2001 and 2003 and two subsequent laws that accelerated and extended some of the 2001 and 2003 provisions during the 2001-2010 period. These changes are known as the Bush tax cuts, which were scheduled to expire after 2010. During the Obama Administration, Congress enacted economic recovery legislation that created the Making Work Pay Credit, which was in effect for two years (2009 and 2010). The same legislation expanded two important tax credits for low-income working families, the Earned Income Tax Credit (EITC) and the Child Tax Credit. Congress also enacted the Affordable Care Act, which included several tax provisions. The only ACA provisions included in this analysis are two significant tax hikes for the rich — an increase in the Medicare payroll tax for high earners and a new tax on investment income for high-income individuals. After a protracted debate, Congress and President Obama agreed at the end of 2010 to extend the Bush tax cuts for two years, 2011 and 2012. They allowed the Making Work Pay Credit to expire but replaced it with a payroll tax “holiday,” which reduced Social Security payroll taxes paid in 2011, and this was eventually extended through 2012. Lawmakers also extended expansions in the EITC and Child Tax Credit for two years. After another protracted debate, Congress and President Obama agreed at the start of 2013 to make most, but not all, of the Bush tax cuts permanent. The same legislation extended the expansions of the EITC and Child Tax Credit for five years. In 2015, Congress made the expansions of the EITC and Child Tax Credit permanent. In 2017, Congress and President Trump enacted the Tax Cuts and Jobs Act (TCJA). This law added personal income tax cuts and estate tax cuts on top of those Bush-era provisions still in effect and cut the corporate income tax as well. Other business tax breaks in TCJA benefit owners of “pass-through” businesses, which pay the personal income tax but not the corporate income tax. The bonus depreciation/expensing provisions enacted as part of “extenders” legislation and as part of TCJA are excluded from this analysis. This analysis also excludes the portion of corporate tax breaks that ultimately flow to foreign investors who own shares in American corporations. The appendices provide more detail on how specific legislation changed the federal tax code. More detailed figures are provided in the attached tables. Economic Growth and Tax Relief Reconciliation Act of 2001 (EGTRRA), the 2001 Bush tax cuts. Jobs and Growth Tax Relief Reconciliation Act of 2003 (JGTRRA), the 2003 Bush tax cuts. Working Families Tax Relief Act of 2004 (WFTRA) and Tax Increase Prevention and Reconciliation Act of 2005 (TIPRA, enacted in 2006) which extended and accelerated the 2001 and 2003 tax cuts. Various laws reducing the Alternative Minimum Tax (AMT). Tax Relief, Unemployment Insurance Reauthorization, And Job Creation Act Of 2010 (extended the Bush personal income tax cuts and most of the Bush estate tax cut, as well as the ARRA expansion of the EITC and Child Tax Credit, for two years through 2012). American Taxpayer Relief Act Of 2012 (the “fiscal cliff deal”) which made permanent most, but not all, of the Bush tax cuts and expanded the ARRA expansions of EITC and Child Tax Credit for five years. Tax Cuts and Jobs Act of 2017. See ITEP report on the 2018 impacts of TCJA. Tax Relief, Unemployment Insurance Reauthorization, And Job Creation Act Of 2010, which extended the Bush personal income tax cuts for two years through 2012. American Taxpayer Relief Act Of 2012 (the “fiscal cliff deal”) which made permanent most, but not all, of the Bush tax cuts. American Recovery and Reinvestment Act (ARRA), the stimulus enacted in 2009, which expanded the EITC and the Child Tax Credit. Tax Relief, Unemployment Insurance Reauthorization, And Job Creation Act Of 2010, which extended the ARRA expansion of the EITC and Child Tax Credit for two years through 2012. American Taxpayer Relief Act Of 2012 (the “fiscal cliff deal”), which extended the ARRA expansions of the EITC and Child Tax Credit for five years. Protecting Americans from Tax Hikes (PATH) Act of 2015, which made permanent the ARRA expansion of the EITC and Child Tax Credit. Tax Cuts and Jobs Act of 2017. Economic Growth and Tax Relief Reconciliation Act of 2001 (EGTRRA), the 2001 Bush tax cuts (phased down the estate tax and repealed it for 2010). Tax Relief, Unemployment Insurance Reauthorization, and Job Creation Act Of 2010 (extended most of the Bush estate tax cut, but not its full repeal, for two years). American Taxpayer Relief Act Of 2012 (made permanent the lower estate tax). Tax Cuts and Jobs Act of 2017 (further reduced the estate tax). Patient Protection and Affordable Care Act (Obamacare) (increased Medicare payroll tax on wage income by 0.9 percentage points for high-earners). Tax Relief, Unemployment Insurance Reauthorization, and Job Creation Act Of 2010 (payroll tax holiday reduced employee-paid Social Security tax by 2 percentage points in 2011, eventually extended through 2012). Tax Cuts and Jobs Act (reduced corporate tax rate, new rules for offshore profits, and other changes). Patient Protection and Affordable Care Act (Obamacare) (created the net investment income tax of 3.8 percent for high-income individuals). This analysis uses ITEP’s microsimulation model, which generates tax estimates for a sample of representative taxpayer records. For an explanation of the model, see the ITEP Microsimulation Tax Model Overview at https://itep.org/itep-tax-model-simple/. For example, many “extenders” laws enacted by Congress have included provisions to extend “bonus depreciation,” allowing businesses to write off the cost of purchasing equipment more quickly. This analysis excludes bonus depreciation provisions, including the bonus depreciation that was enacted as part of the Tax Cuts and Jobs Act of 2017. For example, ITEP has estimated that the corporate tax cuts included in TCJA will ultimately provide $47 billion to foreign shareholders of American corporations in 2018 alone. Steve Wamhoff, “Extensions of the New Tax Law’s Temporary Provisions Would Mainly Benefit the Wealthy,” Institute on Taxation and Economic Policy, April 10, 2018. https://itep.org/tcja20182026/ The portion flowing to foreign investors is assumed to be smaller in years after 2018 as the share of benefits flowing to shareholders (rather than labor) declines somewhat.